I’ve been kitesurfing for a long time. Years before there was even water relaunchable tube kites, I was flying foil kites on land and in the snow. I remember how excited I was when I first discovered there were other people who flew kites in Ithaca one winter long ago on the ice shelf at Stewart Park. Together we worked to figure out how to ride on the lake and failed tragically to stay upwind until Wing Eng finally went out on a 4.9 non-water relaunchable Blade II buggy racing foil kite and a 6′ long piece of plywood strapped to his feet with chopped up mousepads. Oh, how the times have changed. The Spitfire is designed for jumping and wave riding, but the best part about it is the way it feels to ride. Not me, this guy uses straps. After thousands of hours riding over almost 2 decades the sport was starting to lose interest for me. At 44 I had reached the peak of what I was able to do without seriously injuring myself. I tried lots of harder powered tricks, including some kite looping tricks and always ended up hurting myself bad enough to wonder why I was trying them. For the most part, I wanted to just get out on the water and jump 30 feet in the air and do nice slow front rolls all day long. The kites got better and better until the kites I ride today are what I really wanted to ride when I started but had not been designed yet. The Flysurfer Speed and Sonic FR kites I fly today are what I wanted to by flying back when I first started to ride. 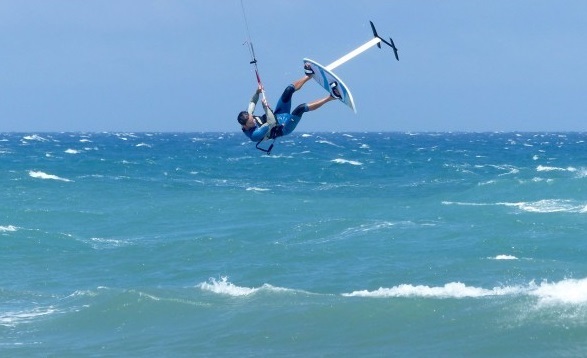 I laugh when I think about the first water relaunchable tube kite I bought, a 13.5 AR5 Naish with a wrist leash attached to a rear line and no chicken loop release. If I ever had to dump the kite, I couldn’t and it probably would have ripped my arm out of it’s socket if I did. That kite was so bad that I didn’t even sell it, I just threw it away because it was so dangerous. $2000 down the toilet. Such is life.